I’m re-running a few old posts from my trip to Uganda. This one was originally published February 14, 2008. This morning we visited an HIV/AIDS hospital. That is not a sentence that I, in my sheltered little life, ever expected to write. Then again, most of my expectations about everything have been blown out of the water these last few days. We visited Mildmay HIV and AIDS hospital, one of only two hospitals in the entire world devoted entirely to treating HIV and AIDS (the other one is in the UK). Compassion partners with them to obtain treatment for Compassion children. We were greeted by the staff with overwhelming hospitality (upon first meeting you, Ugandans always say “You’re welcome”—this is one of the most endearing things I will remember about them), and they gave us a thorough presentation about the history and funding of their facility. I’m counting on some of my fellow team members to blog these statistics—they’re interesting and important, but I generally try to steer clear of anything resembling math. Anyway, the statistics aren’t what I’ll remember about today. For privacy reasons, Mildmay doesn’t allow photographs to be taken on-site, so I once again am going to try to find the words to tell you about this place. It was nothing short of remarkable. All throughout this city, the poverty is rampant and in your face on every inch of the roads. When I have a faster internet connection, I’ll be able to show you what I mean. But amazingly, we entered the gates of Mildmay to a different world. It’s built into the side of a hill overlooking the rolling hills of Kampala. The grounds are lush and meticulous, and the buildings are spotlessly clean. The facility is actually dozens of smaller red-brick buildings connected by winding covered pathways. Like most Ugandan buildings, they are all open air, but fans blow a gentle breeze through the windows and corridors. The rooms are freshly painted, the grass is inches thick. A deliciously sweet smell—presumably from the lush landscaping—hangs in the air. It’s a place of gentleness and dignity, and you can almost forget, for a second, how sick the patients are. We wound through the waiting area—it was a sea of people. Some of the faces looked hopeful, some of them look frightened, many looked terribly empty. The staff hosted us for a proper British tea (this is a former British colony, and there is still a strong British influence in the culture), and then they took us to the “Noah’s Ark”, a center for HIV-positive children who haven’t yet developed full-blown AIDS. The children laughed and played, while a cartoon hummed happily behind us. I knelt down to speak with a little nine-year-old boy named Bosco. An interpreter helped me tell him that I have a nine-year-old son back in America, and Bosco laughed, giving me a big hug. I gave him a sticker. We headed to a clinic for the HIV-positive children who are beginning to develop some signs of infection. A breeze blew through, and the room smelled clean. A little boy lay groggily on a cot, while his mother sat next to him. I walked over to him and stroked his arm; it was burning up with fever. The mother looked tired. We continued to wind through the facility, visiting the dentist office and library and other departments, finally coming to the top of the hill to Jajja’s Home. 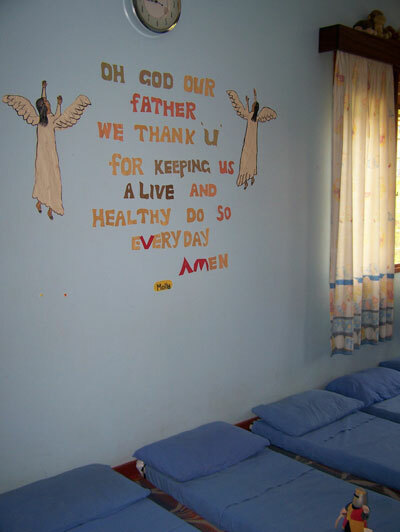 This is the pediatric facility for children that have developed full-blown AIDS. Sophie and I shot each other a look, trying to brace ourselves. Several of the children were outside under a tent for a special presentation by a well-known local gospel singer. The singer was HIV-positive himself, and our interpreter told us how he was singing about how God had carried him through his illness. The kids danced and sang and jumped and waved their arms—evidently this was quite a special event. We walked into the sick ward. We weren’t able to approach any of these children—we carry germs that are a risk to them. But we were able to wave and smile—I saw one little boy, about 6 or 7, struggle to raise his arm in a return wave. Before we left, I passed a mother sitting at the side of her baby’s bed. He was probably no more than two years old, and he was motionless, an IV strapped to his arm. The look on the mother’s face will stay with me forever. It looks just like you’d expect the face of a mother to look when she’s watching her child waste away in front of her. I reached out and put my hand on her shoulder. “God bless you,” I whispered to her, and she smiled back at me. In those brief seconds, I think I prayed harder than I’ve ever prayed in my whole life. Our tour ended in the cheerfully decorated classrooms. Every inch of the walls were covered with bright posters and chalkboards and bookshelves. In a quiet room off to the side were rows of neatly-made mattresses, where the littler ones could nap in the afternoon. This brings tears to my eyes. What a life-changing experience. Praise the Lord for a wonderful facility like that to help the children and their families. What an incredibly perspective-changing place to visit. You painted a wonderful word picture. I truly have nothing to complain of and everything to be thankful for – a simplistic conclusion, perhaps, but ever so true nonetheless. I DON’T HAVE PROBLEMS! Thank you for sharing. Truly unbelievable! I just cannot even imagine seeing those precious children like that. The prayer was a good way to end the post. Honestly, I have no words. Thank you for showing us the hidden children through your words! AIDS is so horrifically tragic – a death sentence in this African world. I wept the first time I saw that written on that wall. Your trip has prompted me to pray for these children; without you going and posting about it, I never would have. Thank you so much for posting this. What a blessing it is to read how good we mamas with healthy children have it. I’ll have to slap myself when I start complaining. I have. it. good. Real good.